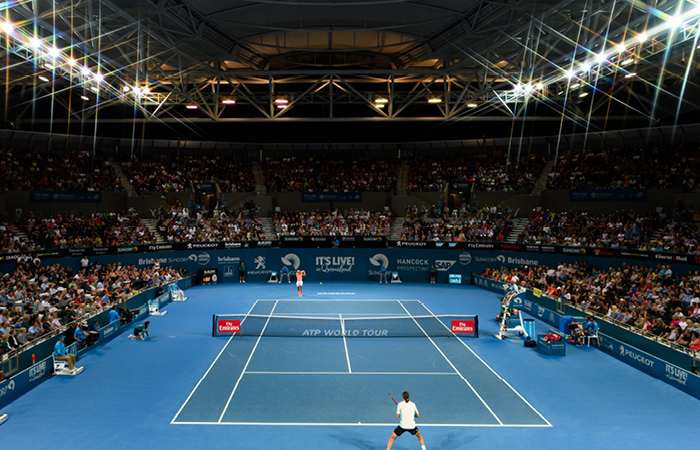 A crowd of almost 100,000 fans poured through the gates of Queensland Tennis Centre to enjoy eight days of superb on-court action and off-court entertainment at Brisbane International 2017 presented by Suncorp, where Grigor Dimitrov (BUL) and Karolina Pliskova (CZE) were crowned the men’s and women’s singles champions. After eight days of world-class action at Queensland Tennis Centre, this is the final serve. Grigor Dimitrov (BUL) claimed his maiden Brisbane International crown and fifth ATP Tour title with a win over Kei Nishikori (JPN). The world No.17 overcame Nishikori 6-2 2-6 6-3 to register his first victory over the world No. 5. World No.6 Karolina Pliskova (CZE) won her first Brisbane International trophy and seventh career title, defeating Alize Cornet (FRA) 6-0 6-3. Pliskova became the second player from the Czech Republic to win the title, following Petra Kvitova’s victory in 2011. In the men’s doubles, Thanasi Kokkinakis (SA) and Jordan Thompson (NSW) beat Gilles Muller (LUX) and Sam Querrey (USA) 7-6(7) 6-4 in their first tournament as a pairing. The duo will now be on opposite sides of the net when they meet in the first round of the Apia Sydney International. Top seeds Bethanie Mattek-Sands (USA) and Sania Mirza (IND) won the women’s doubles title with a 6-2 6-3 victory over number two seeds Elena Vesnina (RUS) and Ekaterina Makarova (RUS). By winning, Mattek-Sands (USA) overtook her playing partner at the top of the WTA Doubles Rankings. Milos Raonic (CAN) clocked the fastest serve of the tournament at 238 km/h. A total of 334 aces were served on Pat Rafter Arena, with tournament partner Treasury Brisbane donating $83,500 to the tournament’s official charity, Ronald McDonald House South East Queensland as part of the Aces for Hearts initiative. Australian tennis greats Roy Emerson and Evonne Goolagong-Cawley presented the Roy Emerson Trophy and Evonne Goolagong-Cawley Trophy to the men’s and women’s singles champions respectively. A huge crowd of 96,107 fans attended Brisbane International 2017, which beat last year’s total by 62 and is the third highest in the nine-year history of the tournament. The all-time event record stands at 105,730, which was set in 2014. Four sessions achieved record attendance figures: 6,879 for the night session on Tuesday 3 January; 6,233 for the night session on Thursday 5 January; 6,128 for the night session on Friday 6 January; and 6,466 for the night session on Sunday 8 January. A total of 89 print, radio, local television and photographic media provided detailed coverage of the event to news outlets worldwide. Twelve countries were represented in the media room, including Japan, South Africa, USA, England, France, Poland, Germany and Spain. The event was broadcast to 196 territories. The Brisbane International was covered across multiple social media platforms including Facebook, Twitter, Instagram, YouTube and Snapchat. The Brisbane International Facebook page grew to 74,468 fans, while Rafael Nadal’s first practice at the Brisbane International was broadcasted LIVE on Facebook to over 1 million people. On Twitter, @BrisbaneTennis grew to 27,615 followers, with up-to-the minute event coverage and exclusive behind the scenes posts. The tournament Twitter account tweeted more than 1,200 times. The official tournament hashtag #BrisbaneTennis was used more than 28,000 times across Twitter and Instagram and trended nationwide multiple times. The most engaging tweet of the tournament was Kei Nishikori’s famous fans – Roch #Nakaoka and Tetsuro #Degawa – which was engaged with over 76,000 times. On Instagram, Brisbane International attracted 3,761 followers with the most engaging post, an image of Rafael Nadal arriving at the Stamford Plaza, resulting in over 1,200 likes. For the first time, Brisbane International had their own customised Snapchat filter, which was made popular by patrons attending the event. Vision of press conferences, match highlights, practice sessions and more was uploaded to the tournament’s official YouTube channel, which attracted almost 553,000 views during the tournament period. The most watched video on the Brisbane International YouTube channel was Rafael Nadal before he went on court against Alexandr Dolgopolov, titled ‘Rafa knows when you’ve got to go, you’ve got to go’. The clip was viewed more than 19,000 times. It took 331 hours to string 992 racquets. Almost 12 kilometres of string was used, with eventual champion Grigor Dimitrov (BUL) requesting the most amount of racquets to be strung (45). A total of 350 volunteers helped run the tournament. The Suncorp Ballkids squad was comprised of 105 boys and girls. A total of 12,528 Wilson tennis balls were used. Players were transported by a fleet of 24 Peugeots, with 67 drivers clocking up 4,212 hours. The players were served over 500kg of pasta, whilst the patrons got through more than 6,000 Aperol Spritz and over 5,000 punnets of strawberries from 40 food and beverage outlets.